The new Morclean VapourSteam350X generates super heated steam. This new concept in car cleaning provides a brand new method of steam cleaning without using the volumes of water that a typical high pressure cleaner uses. Now typical family or saloon car can be cleaned with steam - but using around about one ordinary glass of tap water. This new VapourSteam method simply saves water, and reduces your water bill. You save water by reducing both the amount of fresh water you use and the amount contaminated water run off that would otherwise need to be disposed via a mains drain. A typical jet wash uses around 15 Litres of water per minute, that's around 900 Ltrs every hour. Where as an VapourSteam350X uses just 6.5 Litres of water per hour. So instead of having to dispose of many thousands of Litres of waste water during the day, the waste water from the VapourSteam350X is much less, and can be easily contained or hand wiped off the vehicle rather than having to dispose via a mains foul drain. The VapourSteam350X generates 115psi of high temperature super heated steam, but it’s easy and safe to use. Most cars can be hand wiped after steam cleaning. This means that while you save fresh water, little waste water falls to the ground entering the drains and so you reduce disposal costs too. The integral water tank can be topped up from a container of water or continually filled from a standard hose pipe. The new VapourSteam350X uses a diesel fired boiler to produce 37.7Kg of super heated steam per hour, but without the need for a high amperage power supply. The 350W power consumption is around a third of the Watts of a domestic kettle and so it can be set up using a standard 13amp socket or a small generator. Can you Steam Clean a car with just one glass of water? The 350B is a cordless version of the VapourSteam350X. 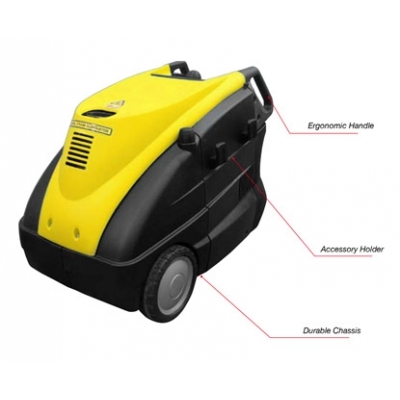 Running via an integral battery and built in charger the VapourSteam350B can be operated on site without the need for a mains power supply, socket or generator.